Description: Gotham's protector has returned to duty, his actions having lead to a major gang being split up into a bunch of clusters, one of them following his example. Meanwhile, the man known as the Joker is planning his own sinister return.. The thing about adapting a piece of work is that everyone will have their own opinion on what is important from the original product. Therefore, some modern movie makers has gone the route of splitting their movies up in two in order to get as much from the original as possible (a trend I believe started with Harry Potter). So in this one we delve further into the theory of Batman being the cause of all his villains. On top of that as a bigger stake in the film we have Superman showing up in the picture, being the tool of the president of the united states. What I like about this movie is that even though it's been quite a while since I reviewed the last one, I was able to immediately get back into the action. Of course, this could be due to me having read the original graphic novel several times but I feel that, since the original story is made so you get it all in immediate succession , it's still a feat to be able to carry over the status quo and expand upon it, just like a good sequel should do. However, as with most of the DC direct to video animated movies, I have to stress that they're mostly made with the already established fanbase in mind. While this one may not be the worst case, taking some of the things at arms length never hurts. As for the voice work, I really liked Peter Weller's take on an older Bruce Wayne, giving him a deep voice, but not cartoonishly dark or gruff like, say, Christian Bale's take on the character. In all honesty, while Kevin Conroy may very well be considered the best Batman voice actor out there, Weller gives him a run for his money in this performance. It felt like he was channeling Adam West in his performance, an acotr who unfortunately does not get as much praise in this role as he rightly deserves. If you've forgotten what Adam West sounds like, you need not look further than the current animated satire show Family Guy, where he voices the mayor of the fictional city of Quahog. One thing that's always nice in elseworld stories like this one is seeing alternate takes on popular characters. In this case I'd like to highlight Jim Gordon, the commissioner of Gotham Police department (although recently retired in this case). While none are quicker to give Frank Miller flak than me these days, I have to commend him on his writing skills for this particular character. Almost every version of Gordon he's done has been right on the money, regardless of how he may have done in the case of a lot of other characters. Especially this story and "Batman: Year One" is where Millers ability to write Jim Gordon shines through. The animation style continues to be pretty good, keeping the basic look of the original comic while updating it for, I imagine, the purpose of broad appeal. Okay let me retrace my steps a bit. What I mean is that it looks like the original drawings to a point, but a lot more clean. A lot of the rough lines are cleaned up and the proportions for the body types are more anatomically correct. The coloring is also better, but that's to be expected when the original artist has his best work in the negative space department, his most beautiful work being that of the Sin City series. All in all, this movie manages to update the story into a broader appeal and to a modern audience. Also toning down some of the more strong messages from the original work. While still managing to tell a good story and keeping alive the spirit of the story. 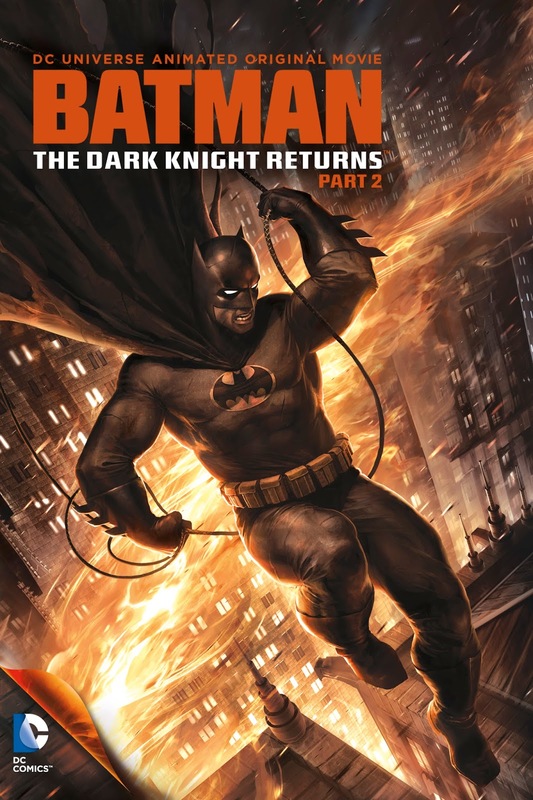 To any fan of, especially the modern Batman movies, I strongly recommend checking both this and it's predecessor out, as a lot of the things that happen in the "Dark Knight Trilogy" are inspired by this story. I also recommend it to anyone who loves the Batman character and his extended cast - this take on him is a classic and this animated version manages to do it justice.